What is ELD ? ELD Device? What is eld one may ask? ELD is a short version of Electronic Logging Device.Those devices are also called E-log or electronic logbooks. Regardless of the name one may use to describe the device, this device is going to be in every truck by 2019. So you may ask what is the purpose of this device and what does it do ? In terms of its composition, the ELD device is simply a piece of hardware. The ELD device is meant to record diffrent information pretaining to the truck(or any other commercial vehicle)’s operations. This device can record the information by itself. However, in order to display the information the device requires a tablet or a smartphone. The ELD Devices came to replace the electronic On-Board Recorders (EOBR) that were previously used. The ELD is recording many pieces of valuable information. The most important and the most obvious one is the number of hours a truck is in operation. In addition to that, the device records when the truck is in motion, the rate of speed the truck travels . Further, the device tracks parked hours / idle time. The Federal Motor Carrier Safety Administration (FMCSA) utilize the data collected by the ELD. The authorities, enforce Hours-of-Service(HOS) rules. It is that usage that pushed the federal government to pass the ELD mandate. However, there are other usages for the data. Many industry experts are against the use of ELD devices. Industry experts debate the true motive to the ruling. Some experts believe the purposes of the ruling is to fine truck drivers and generate additional revenue for the government. The federal authority target driver fatigue by limiting the number of hours drivers are forced to work. Reducing the number of hours drivers spend on the road will make the roads safer for everyone. Trucking companies use the data to fine drivers that are driving over speed limit or commit other moving violations without getting pulled over by law enforcement. The ELD device records drivers commiting traffic violations. Unnecessary risks, such as, driving over the speed limit eliminated by reviewing ELD device’s data. Transportation companies may measure the performance of the engine. Engine performance evaluated by analyzing RPM, fuel consumption , torque and speed. Trucking companies utilize the devices to uncover harmful drivers. Also, drivers using the truck inappropriately. For instant, some truck drivers use the commercial vehicle for personal errands. Such practice increases the hours of use and decrease the value of the rig. What ELD Device MUST have ? 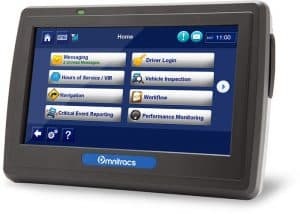 As per the FMSCA rule, an ELD device must connect to the truck’s engine. The ELD device retrieves engine data. The data displays in the form of a graph. The device have various driver modes. The driver modes are on-duty , off-duty and driving. The format of the data in a standardized form established by the Federal authority. The driver can update the driving mode. The device will verify the selection. The device verifies the driver mode by evaluation of the movement of the vehicle. Older tracking applications, allow the driver to enter their status but did not verify this selection. This allowed drivers to falsify their electronic log books. The loophole made electronic applications invaluable as their counterparts–outdated paper logbooks. The device must be able to send the information via wireless , USB or Bluetooth technology to the proper authorities for review. How much does an ELD Device Cost ? The cost of ELD device can range between $240 to $700 a year per truck. The average cost of ELD device hoovers around $495 annually per truck. For more information regarding the different costs check electronic logging devices comparison.